LeBron James just led his team to one of the most incredible comebacks in the history of professional sports – and that still isn’t enough for some people. But it’s certainly good enough for me. I’m happy to use my first opportunity to contribute to The Undefeated to congratulate LeBron and his Cleveland Cavaliers coaches and teammates on what they just pulled off. LeBron doesn’t need me to speak for him. His record on and off the court speaks for itself. But the way he willed the Cavaliers to come back from a 3-1 deficit in the NBA Finals was beyond the beyond. He showed himself to be a true gladiator, the ultimate competitor. On paper, the Cavaliers did not appear to stack up with the Golden State Warriors. But as LeBron played the extra minutes, put in the extra effort, and carried the team on his back, he inspired both the Cavs’ starters and their bench to be more competitive and take the Warriors out of their game. In the process, I think he displayed even more maturity, composure and command of the game than he has previously, and that only comes with experience. LeBron has now been to the Finals six straight times and has won the ring in three of them. That puts him in some pretty rarefied company right there. And to think he did not receive a single first-place vote for MVP in the NBA’s regular season. Frankly, I think the people who voted that way are biased and should be prohibited from voting in the future. But at the same time, I have no doubt that the snub gave LeBron some extra motivation. 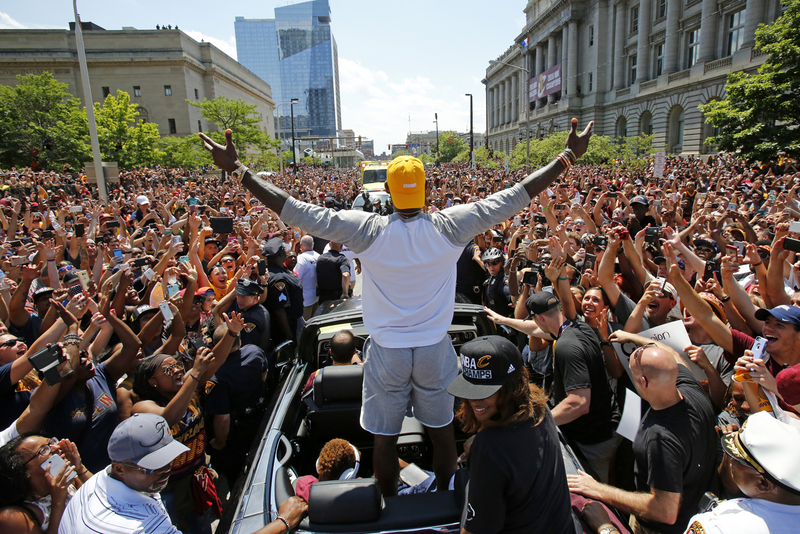 Cleveland Cavaliers’ LeBron James, center, stands in the back of a Rolls Royce as it makes its way through the crowd lining the parade route in downtown Cleveland, celebrating the basketball team’s NBA championship. So I can understand why he might have gotten into it a bit with Steph Curry – at least verbally – as the series progressed. I found that fun to watch. This championship was also a big win for all of northeastern Ohio. Cleveland was once a “home away from home” for my Cincinnati Royals team in the NBA’s early years, and I’ve since visited there many times on both business- and basketball-related matters. So I have some sense of understanding of what ending a 52-year championship drought meant to the city and its long-suffering fans. I learned in my own high school years at Indianapolis Crispus Attucks – when we became the first all-black team and the first Indianapolis team to win a state title – how a championship win can galvanize an entire city and bring people together. It also brings you into the spotlight of public scrutiny and media coverage, which has both its plusses and minuses. With social media added to the equation the way it is today, the noise never stops. I think LeBron is not always understood, often mischaracterized, often criticized. It seems that as soon as you become successful, the media, and often the fans, will be all over you. Having had a taste of that myself during my playing career, and again more recently in the blogosphere, I also have a sense of what that is like. I hate to think of how the haters would have responded if Cleveland had lost the series. Any time an athlete is unique, or breaks the mold – especially today with all the overemphasis on analytics – and is not afraid to speak up, he or she will become a lightning rod for criticism. It comes with the territory. I think LeBron has handled it pretty well. I think he was able to tune out most of the white noise, focus on the task at hand, and respond only when he felt the time was right. So, I want to cut through all the noise and talk about what I think LeBron represents as an athlete, an entrepreneur, a community leader, and – now that free agency has begun – someone who has been able to take advantage of the Oscar Robertson Rule to the ultimate degree for which it was intended. No one has ever before seen a player quite like LeBron. He’s a five-tool player, fundamentally sound, and able to do practically anything on the court. As the NBA continues to evolve, I think he is the model other players ought to emulate. I also admire him for continuing to improve his command of the game and his basketball IQ, year after year, instead of coasting on his athleticism. 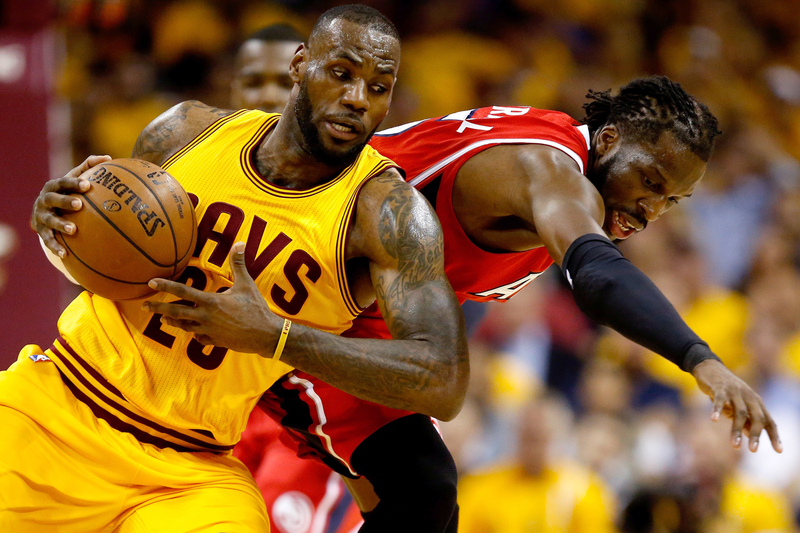 LeBron James #23 of the Cleveland Cavaliers battles for the ball with DeMarre Carroll #5 of the Atlanta Hawks in the first quarter during Game Four of the Eastern Conference Finals of the 2015 NBA Playoffs. And he understands and respects the history of the game, the players who came before him and set standards of play in various areas. Which many of today’s players do not. Obviously LeBron is a physical force – a Shaquille O’Neal who can play outside, if you will – but he doesn’t depend only on his size and strength. He has great footwork, he can set up in any position on the court, and he now finishes much better when driving to the hoop. His shot selection has improved, he’s become better at involving his teammates, better at finding the open man, and better at recognizing what the defense is giving him and countering accordingly instead of trying to force passes or shots that aren’t there. And his defense has improved. I don’t think Golden State was prepared for just how dominant a presence he could be at the opposite end of the court. And he can still get better, as his mental approach to the game gets even better. He’ll find that the game will slow down for him even more. He can become even better at involving his teammates in the game. He can develop a more varied repertoire of moves and shots around the basket – finesse as well as force. If he does that, he’ll put additional pressure on the defense and he might also save himself so much physical wear and tear. If he can avoid injury, I think he can play pretty much as long as he wants to. I know how hard it is to be taken seriously in the business world when you’re an athlete – especially a black athlete. After 40 years of running my own companies, I still run into that kind of resistance. That’s why I admire what LeBron has been able to accomplish off the court just as much as I do his basketball achievements. LeBron’s business management company, LRMR Ventures, has set a new standard with its creativity, professionalism, and intelligence in branding, marketing, and making deals while keeping the business in-house. He and his boyhood friends, Rich Paul, Maverick Carter and Randy Mims, have shattered the stereotype of the posse that typically surrounds star athletes and entertainers and generated serious money on their own. And they just signed Ben Simmons, this year’s No. 1 NBA draft pick. I think it’s actually been to their advantage that they grew their company as they did without going the usual route of – and picking up the usual attitudes from – working within established agencies in New York or Los Angeles. In this manner, LeBron and his colleagues are setting a welcome example that other athletes still seem slow to emulate: You need to learn how to control your own destiny. Whatever the “conventional wisdom” says, there are always other avenues leading to the same goal. 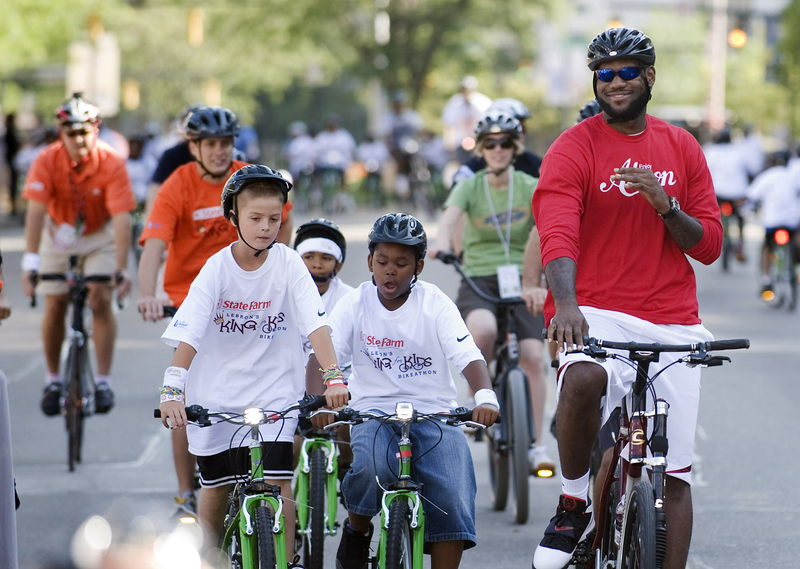 LeBron James, right, finishes his ride during the LeBron James Family Foundation, King for Kids Bike-a-thon, in Akron, Ohio, Saturday, Aug. 7, 2010. Practically every athlete today has his or her own charitable foundation and/or causes for which they advocate. In reality, some of these are little more than photo ops – show up, smile for the cameras, shake some hands and go home. Not much in the way of personal involvement. Because LeBron came out of challenging circumstances, he can personally relate to what people need. His community involvement is for real, and it’s personal as well as financial. He cares about the city of Akron, the city of Cleveland, and he has provided support in many different ways. He has also lent his support to NBA Cares initiatives when called upon. I believe that if you’re blessed with talent that leads you to financial success, you have an obligation to give back and to set a good example. He has. Forty years ago this year, after six years of groundbreaking legal action, my player rep colleagues in the National Basketball Players Association (NBPA) and I managed to secure a court settlement with the NBA that paved the way for free agency, not only in the NBA but ultimately in all of professional sports. This settlement, known as the Oscar Robertson Rule, was a game-changer that forever altered the landscape. Players now had a degree of control over their own destinies instead of being bound to one team for life. And you won’t believe how strongly the NBA owners opposed what we were trying to do. Today, some of the same people who vehemently opposed us are now taking credit for the growth and prosperity of franchises in all professional sports. What did the Los Angeles Clippers sell for, $2 billion? It was the Oscar Robertson Rule that enabled LeBron to sign with the Miami Heat when his contract with the Cavaliers expired in 2010. He took a lot of heat for his alleged “disloyalty,” but he was simply exercising his prerogative as a businessman and making the decision he believed was in his own best interests. Every professional athlete should have the right to make his or her own decisions about where to play, with whom, and for how much money. There is no other business that restricts the people who work in that business from making similar choices. LeBron is now a free agent once again. I hope he re-signs with Cleveland, but at least he has the freedom to make that decision. And when a new salary cap kicks in the following year, he might already be under contract, or he may go through the same process all over again. It’s often been said of LeBron that he really runs the franchise in Cleveland, that he makes or influences coaching and personnel decisions. I don’t know if that’s true or not, but if so, more power to him! He wants to win. He may not always make the best choices, but then, how many coaches or general managers do? Looking back on my own career, I wish I had had similar opportunities. Maybe we wouldn’t have always played second fiddle to the Boston Celtics. Finally, because I regard what I achieved as NBPA president equal to anything I ever achieved on the court, I’m happy to see LeBron taking a more active role in the NBPA, as first vice president and a member of the executive committee. He demonstrated his leadership chops five years ago when he spoke up and rattled some cages during the lockout. Fortunately, since then the NBPA has elected an effective, high-profile president in Chris Paul, the first A-list player to accept that responsibility in 10 years. There is a time commitment involved in working with the union, and you’ll never please all of your colleagues. But at least today, with social media, you can communicate with them immediately and act quickly when the situation demands. And LeBron is a master of social media, whereas I haven’t got a clue. But one thing I am sure of is this: I wish LeBron and I could have teamed up together. Who could have beaten us? Correction: An earlier version of this column incorrectly said LeBron James was NBPA executive vice president.